Much like ColorCombos.com, I think the real value in this site is the ability it gives you to collaboratively work with colors. For example, a client of mine wanted to highlight some text on their site. I took a guess, and picked a shade of yellow. I was able to send her a link to the color, and in return, she sent me back the exact color she would like to use. What I like about ColorMixers, along with its simplicity, is that it makes it especially easy to link to a color, import a color, and download a text version of color pallet. 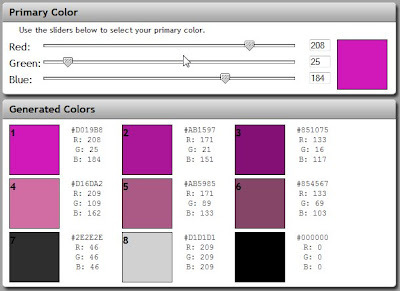 There are better tools out there for discovering color schemes, and creating them from scratch - but for the simple business of talking and tweaking an existing color, this site is hard to beat.